From time to time even hunting success has it’s challenges. The challenge and the reward of good preparation and follow through tracking game after the shot is worth the patience and aggravation. Being aware and patient to follow the right path at the right time is critical to game recovery and to honor your duties as a hunter. Tracking protocol for bow hunting differs somewhat from rifle hunting due to the difference in wound types and follow up shot capabilities. Watch your hit (a good hit and a bad hit get different follow up). Good hit, wait one hour before tracking big game unless you can see the game go down. Far back or other bad hit, wait 4-6 hours. Game will often bed down and die close by if not pushed soon after the hit. Look for the arrow and sign such as frothy red lung blood, dark liver blood, or greenish gut shot sign. Follow blood trail slowly and work it out patiently even if only droplets or footprints are visible. If the blood trail is lost, see if you can find sign in the same direction of travel then make small circles to try to relocate the trail. Remember that hard hit animals rarely go up steep hills and often side hill or go downhill. Search cover thoroughly as deer and even elk and bears can be very well camouflaged, even up close. If the game is still visible try to anchor it with further shooting. Carefully mark the location of the game based on land marks that will be visible when you get to where the game was when you shot. Proceed to the site where the game was shot and look for sign. Follow the game’s last known direction looking for sign or the deer. 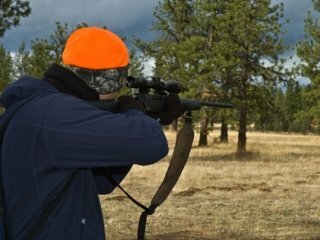 Even if you are dead sure of your shot, keep your gun ready for quick action, but make sure you don’t snap a shot at a deer that isn’t already wounded unless you’re sure it’s the same animal. Follow blood trail slowly and work it out patiently even if only droplets or footprints are visible. Even a good hit will often require some tracking skills, so be prepared and have a plan and flashlights in case the follow up lasts into the night. Trust your instincts and at the same time try to piece together EVERY bit of evidence available to you for as long as it takes. As hunters, careful follow up is our moral obligation. Even though lost game is not entirely wasted and serves to feed the scavengers, the animals we pursue deserve our best efforts and sincere respect.